CHSE Results 2017 : Odisha Plus Two Science Results 2017 is announced by Council of Higher Secondary Education (CHSE), Odisha on 12th May 2017. Students from Odisha can check their results on the website orissaresults.nic.in. Council of Higher Secondary Education, Odisha conducted 12th class examination in the month of March 2017. Now CHSE released the Science stream results on the result website provided by NIC. Students can check the Odisha 12th Results 2017 from the official website or from the direct link provided below. 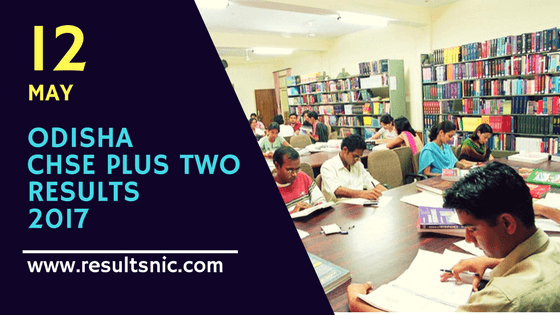 CHSE Odisha plus 2 are to be declared today. The Mass Education minister Badri Naryan Patra announced the results and he said that 81.11 per cent students have cleared the examination out of 90,643 students who had appeared for the science stream exam. 73,523 students have passed the CHSE Examination. 19,087 students have passed in first division, 26,322 in second division and 27,597 students got third division, the minister said. Click on the link "Annual +2 Science Examination Result Published at 11 AM on 12/05/2017"
The CHSE Odisha Plus 2 Results 2017 will appear on the screen. Download/Take a printout of the results for reference. The Council of Higher Secondary Education, Odisha was established in accordance with the Odisha Higher Secondary Education Act 1982. CHSE is in charge of development and regulation of Higher Secondary Education in the State of Orissa. CHSE is conducting the higher secondary examiantion in Odisha. CHSE started functioning on 7th September 1982 in a rented building at Budheswari Colony, Bhubaneswar. After that the Council constructed its own administrative building over Plot No. C-2, Samantapur, Bhubaneswar where it has been functioning since 2nd January 1996. CHSE is functioning on the campus named ”PRAJNAPITHA” at the above address.